Tonight was an awesome episode of THE WALKING DEAD, it doesn’t get any creepier than a man brushing his zombie daughter’s hair, did you see the episode? If you missed any of it, you can read the full recap here. The grossest moment for me tonight was when Rick found the walker that ate Lori and he had a belly that looked very much like Lori’s pregnant one just last week – the blood drag marks were an awesome addition to the gruesome effect. Merle goes after Michonne and he finds her, they get into an altercation with knifes, I wonder who will in this one? Hershel confronts Rick and tells him that he knows he wants to get away from this, but the reality is, there is nowhere to go. Daryl finds Carol’s knife in a walker, is she still alive and hiding out somewhere in the prison? Rick is going all apocalypse on us now in a zombie killing rampage, but he does clean up and finally returns to the group and tells them that he cleared up one of the cell block areas; he apparently just came back to check on Carl. Daryl lets Rick know that he cleared out the generator room and Glenn says that they are going to make another run to get ammo and formula again. Glenn tells Rick that they can help take out the bodies, but Rick doesn’t want anybody’s help and returns to the boiler block. Wow, I can’t wait for the next episode. 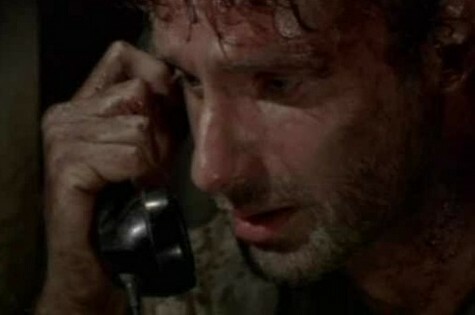 Rumour has it that us zombie loving fans are going to be in for quite a shock to find out just who Rick is on the phone with. Who do you think it is? Sound off your comments below, we would love to know.